A GROUP of Bowerhill residents have expressed their disappointment and anger at the number of trees that are being taken down to make way for a new housing development. Housing developers Taylor Wimpey began work early this year to build 213 homes on land on Pathfinder Way on the land between Bowerhill and Melksham. As part of the initial works, a number of trees and hedgerows have been removed along one side of Pathfinder Way. Trees on the other side of the road are also currently being removed. Local resident Kevin Allsop told Melksham News, “It’s disgusting! Some of these trees are huge, they have taken years to grow to maturity and now they are being chopped down. I’ve approached our local Wiltshire councillor, Roy While, for support, but he said that Taylor Wimpey has been given the go-ahead to proceed, so nothing can be done. A spokesperson for Taylor Wimpey Bristol comments, “The work currently being undertaken is a requirement of the approved highway improvement work and planning permission for delivery of the new homes, all of which has been carefully considered and agreed by many parties over recent years. 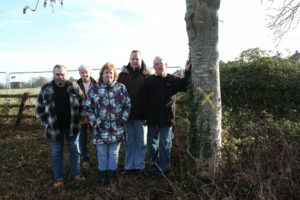 Pictured: Bowerhill residents Kevin Allsop, Kathy Allsop, Alan Smith, Andrew Allsop and John Spirit on Pathfinder Way with the cleared side of the road behind them.